I can remember sitting in junior high school (yeah, we called it JUNIOR HiGH back then…what of it?) 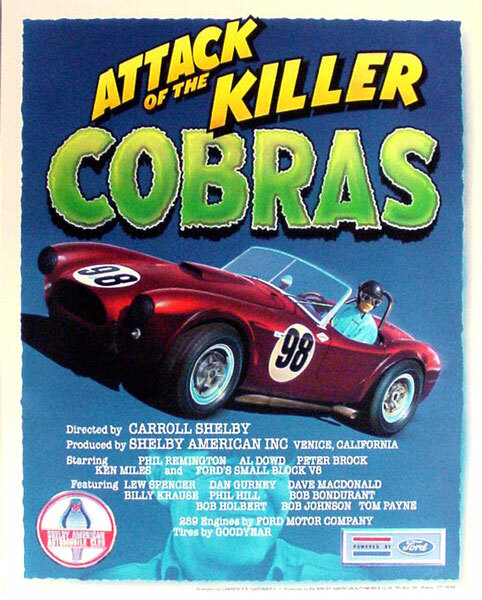 with a friend who was really good at drawing those Ed Roth style hot rods with the weird driver poked through the roof, slobbering all over and looking nasty. We loved it and thought “maybe someday we’ll just sit around all day and draw cars for a living.” Uh…didn’t quite work out that way. Gardinier may have come by this passion via family immersion. He remembers at 5 years old his mother showed him how to draw a car using a photograph of a green ’68 Dodge Dart Super Stocker. “My Dad (Larry Sr.) was a drag racer and actually won the Stock Eliminator class in 1976 at the NHRA Nationals (in a 1967 Plymouth GTX). 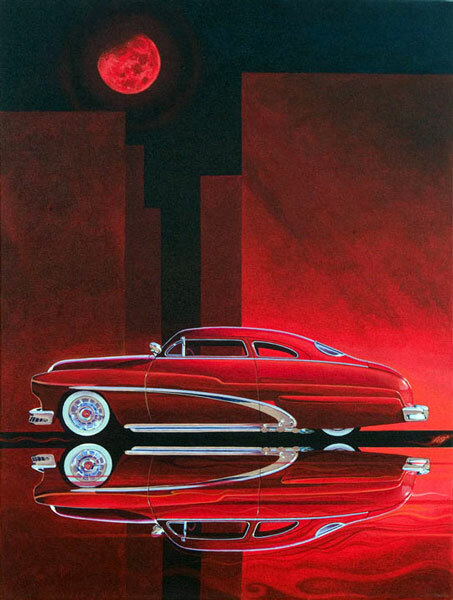 So I’ve been around cars all of my life.” Gardinier says his parents encouraged him to pursue his artistic talent and eventually he found himself doing architectural illustration for a living. 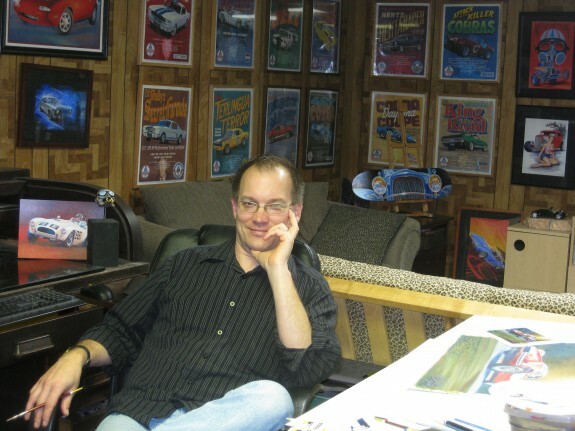 But it wasn’t quite what he wanted, so he worked on automotive art part time and when a lay off came in that profession, he moved into car country full time. 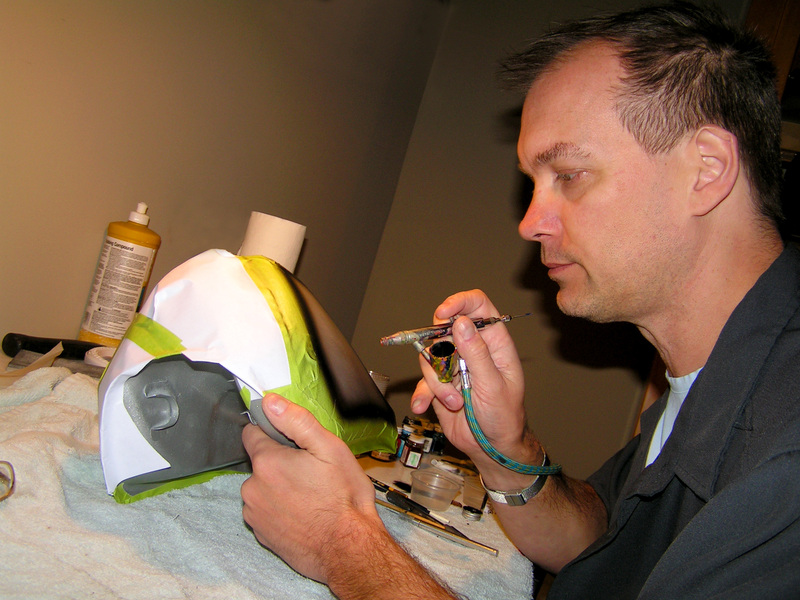 “It’s kind of crowded,” he explains, “with a lot of very talented artists out there painting automotive style subjects.” But Gardinier feels the effort every day is still well worth his time and he’s been able to explore new areas including teaming up with hot rod builder Bryan Fuller to stage “Skull Canvas: A Gallery of Cranial Protection” at the now famous Vintage Motorcycle Festival at Barber Motorsports Park in October in 2012. 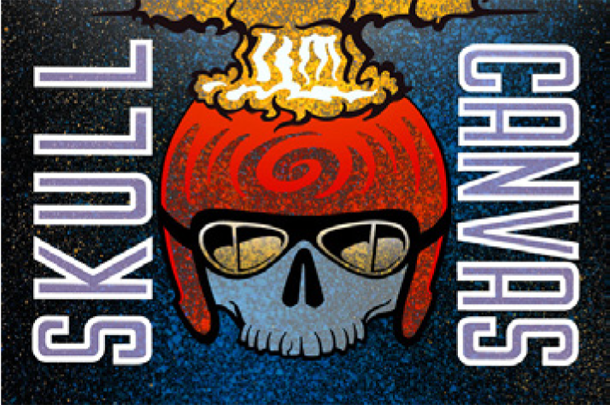 In 2013 he put the Skull Canvas show on by himself . “The show has started off well enough,” he says, “though I’d like to see it grow a bit faster.” This past October the gallery displayed over 40 helmets from artists around the globe with a silent auction being held to sell off the collection to visiting spectators of the Barber Vintage Festival. The event draws nearly 60,000 attendees each year so the artists get an opportunity to show their best creative work to an appreciative audience. 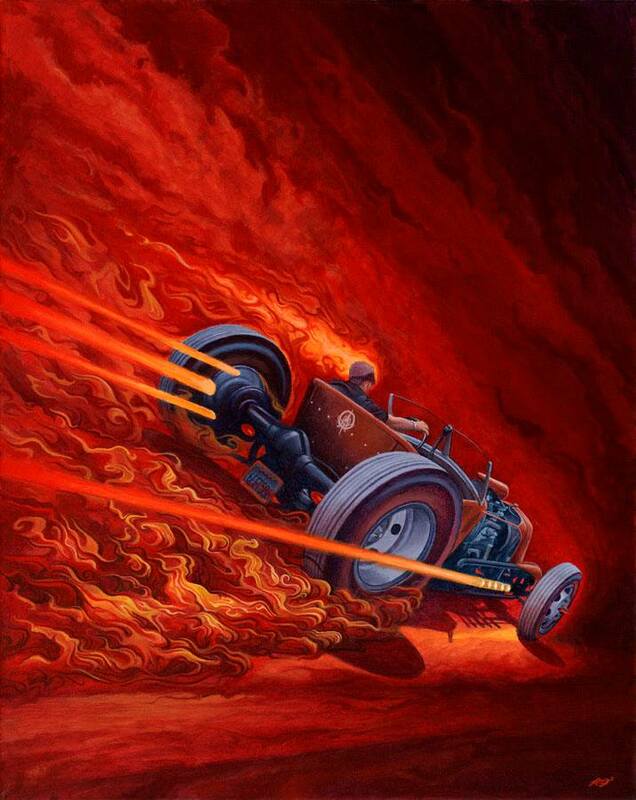 Gardinier gets to be creative each and every day through his artwork (mostly painting acrylics on canvas or board stock) or with some of his design work where he’s asked to come up with logo, t-shirt, motorcycle tank and helmet designs. 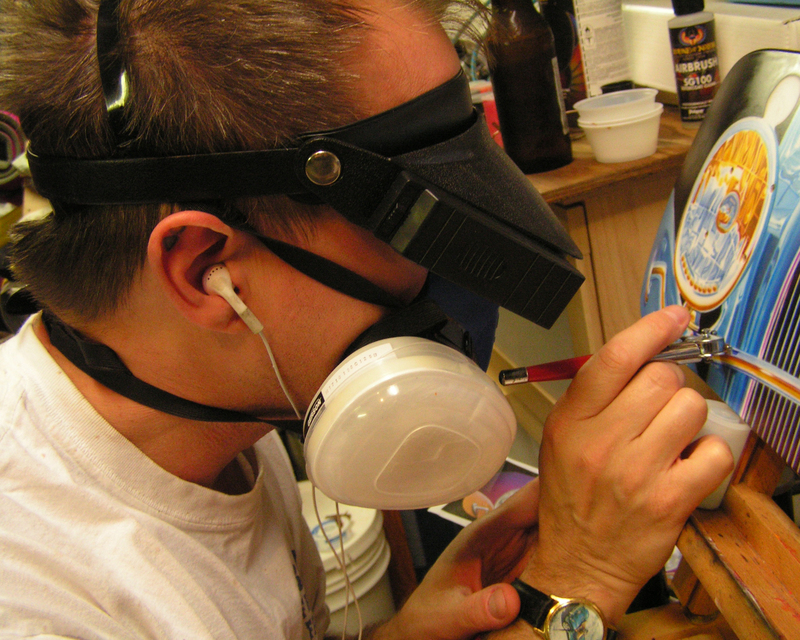 So what does an automotive artist do in his spare time? Fixes things…with his hands. 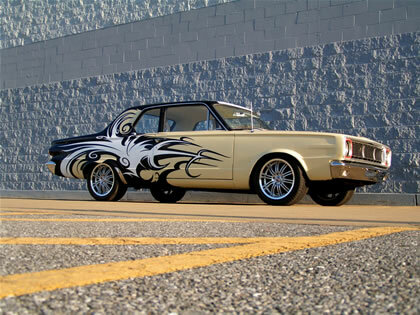 Gardinier has a 1966 Dodge Dart his father was about to sell and he learned how to weld and do major repair on that car. He spent six months designing and painting the Dart by hand and considers his “art car” a perfect reflection of his approach to being creative. “I’m never quite satisfied and want to push to get things perfect.” Being able to handle virtually all aspects of not only restoring the Dart but making it a creative vessel for his artwork was satisfying. “I don’t intend to stop what I’m doing any time soon,” he says. “I just enjoy it too much.” You can contact Gardinier at www.artracer.com or https://www.facebook.com/lawrence.gardinier?fref=ts.